I had forgotten how big they are. Manta rays — first just one — then three — then six — approached us divers in the opposite direction as we swam along Modivaru Manta Point. With their 12-foot wing spans, they briefly blotted out the shimmer of the sun as they swooped above — seemingly as curious about us as we were of them. I love to dive — so much so that my license plate declares “Scuba9” — a take-off on “Cloud 9.” No wonder I was in underwater heaven on a recent nine-day trip to the Maldives aboard the 85-foot motor yacht MY Manthiri, the pioneer in extended diving in the Maldives. A tropical hideaway, The Maldives encompasses some 1,200 coral islands (200 of which are populated) scattered across the Indian Ocean southwest of India. Although exotic, the isles are easily accessed by air from the U.S. on direct flights through Europe or Singapore. For some time now, Europeans have headed to the Maldives for sun-filled vacations. Charter flights arrive daily at the capital of Male, where guests are often spirited away by sea planes to resorts on distant atolls (the English word atoll comes from the Maldivian atolu). Now Americans are discovering another aspect of this paradise: its undersea attractions. And the best way to explore below the waterline is on a live-aboard dive ship. Since they are not limited to the reefs close to a hotel, live-aboards can take divers to varied sites. A typical dive cruise can travel 250 miles and take in three or more atolls depending on the duration of the voyage. Since the airport in Male lies on an island, I took a water shuttle to get to the city itself. A few minutes into the crossing, a school of dolphin came to play in the ferry’s wake — to me, a wonderful portent of things to come. I must admit that I had certain misgivings about going to the Maldives a year after the catastrophic tsunami that devastated parts of South Asia. However, the tidal wave passed over the Maldivian reefs without causing damage. The Manthiri itself gently rode out the tsunami and divers were in the water the next day. I also had been concerned about reports of coral bleaching several years earlier. However, to my eyes the reefs looked as pristine and colorful as on my visit to the Maldives nine years ago. With 11 crew members attending to a maximum of 12 guests, the Manthiri is known for excellent service. There was daily laundry service and my T-shirts actually came back ironed. Nightly turn-down of my bedding made me feel as if I were staying in a five-star hotel (but no chocolates on the pillows). Even more impressive was the pampering we received during our scuba sessions. Diving and the filling of tanks was done from the 54-foot accompanying dive boat (dhoni), the Vasantha, thereby reducing noise and busyness on board the Manthiri. The dhoni had two hot-water showers (an important luxury when you are diving three to four times a day). The dive staff not only assisted us with putting on dive gear, one guy even zipped the hard-to-reach back closure on wetsuits before each dive. Even the rungs on the dive ladders were positioned perfectly. After an often-exhausting dive, having an easy-to-climb ladder brought a smile to my regulator-covered mouth. Most of Manthiri’s crew has been together for 10 years — Manik, still one of my favorite dive masters, was as thorough as ever with his pre-dive briefings. Not only was the crew’s camaraderie fun to be around, it made the flow of the day’s activities seamless. These guys enjoyed their work together and it showed. The food was superb with fresh fish curries the specialty of the house. Meals were served family-style with meat and fish, salads and lots of carbs as choices. Wine was included with dinner, along with lots of fresh fruit and ice cream for dessert. And food was certainly important: because we were doing four dives a day, we were burning calories rapidly. During our trip no one gained any weight! We were even offered dried tuna jerky and coconut immediately after coming up from our dives. This made the short cruise back to the Manthiri on the dhoni even more pleasant. Best of all: the diving was superb — especially the encounters with the Manta rays. These gentle giants often come to the same spots each day to have their gills “cleaned” by smaller fish that provide that service. These “cleaning stations” are like spas for Mantas, and they are very happy to be there. 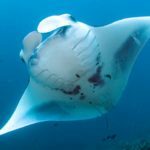 As long as a diver stays beneath a Manta where it can watch you (the eyes are on the lower part of its body), it will hover unconcernedly above human spectators as it enjoys its “treatment.” On several dives as many as six mantas surrounded us. Some younger mantas playfully butted their chests like football players after a touchdown. Were they showing off? The Maldives is famous for its enormous number of fish — we often encountered schools of hundreds. On several dives we came upon “fish balls” of blue-striped yellow snappers that clustered together so as to appear large to a predator. These swirls of fish are a photographer’s delight, offering incredible shots from all angles. Moosa, one of our dive guides, suggested that I take a deep breath on my regulator and then swim into one of these balls. Since I wasn’t scaring the fish with my exhaled bubbles, the snappers stayed together and let me join them in the center. They floated together as I became part of their mass. I felt as if I were inside a yellow balloon with hundreds of eyes. They seemed undisturbed by my presence as I moved with them along the reef. When I finally did exhale, they parted into several groups and then, in moments, rejoined. One of my favorite undersea creatures is the spotted eagle ray — to me, they are grace personified. 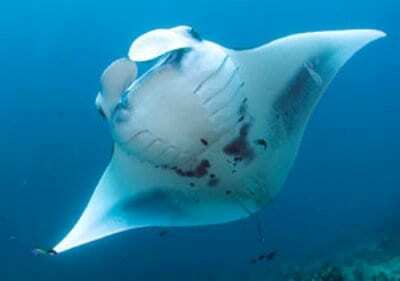 Smaller than Mantas, they have an almost dog-like face and extremely long tails. Often the rays are seen gliding along reef walls — if divers are lucky, they might see groups of three or four. Since many dive locales in the Maldives have a fair amount of current, I used a reef hook for the first time. This simple invention — a twisted piece of metal with a short cord — permits divers to stay in one place on a reef without holding on to a coral patch. You just place the hook in a protrusion to remain stationary. Using the hook at a site called Cherry Caves, I was able to observe five eagle rays that flew past me in the strong current and then returned six times to ride the current back again. It was like watching the Blue Angels flying in graceful unison. On another site, Mata Kandu on Felide Atoll, I took advantage of the reef hook again. A dozen grey reef sharks used the one-knot current to propel themselves along a coral wall; at the end they swam back to a spot right in front of me to repeat the “free ride.” The sharks didn’t appear as if they were hunting at all, but rather having a grand time in the current. They were later joined by a few white-tip reef sharks and a silvertip in what appeared to be a shark playland. Moray eels receive bad press. Because of their sharp teeth and constantly opened mouths (it’s their way of “breathing”), they indeed look threatening. But to divers they are beautifully textured specimens. Like all undersea creatures, they are given respect; we look but don’t touch. I saw morays on almost every dive — spotted morays, mottled morays, green morays, honeycomb morays and more. On one dive our sharp-eyed dive master spotted a juvenile blue ribbon eel. These Dr. Seuss-like eels start off with an all- black body then develop a yellow line across their dorsal fin. Their bodies turn bright blue and yellow as adults, then change to light blue as they mature, and finally light yellow before dying. Even odder: they are born as males and then mature into females (meaning that the females always get younger mates!). Seeing a blue ribbon eel is always a special occasion on my dives. Another rare sighting is the ghost pipe fish. Since the creature is a master at camouflage, actually seeing one on a dive is like finding a four-leaf clover or getting a hole in one. Moosa found one for us that was posing like a piece of coralline algae. Somehow, this one-inch fish had picked out a piece of green, grass-like soft coral to live in that looked exactly like itself. I found myself asking — how does a fish know what it looks like? As much as possible, the schedule was determined by what the divers wanted to do. At one point, the captain picked up on our disappointment when Mantas were no-shows at a site, so he anchored nearby so we could try the next day. This might have thrown off his planned itinerary, but it was what we divers wanted. And we were not disappointed since dozens of mantas swooped and hovered on the next day’s dives. Since people know I’m an experienced diver (I’ve logged over 1,500 dives), they often ask me, “Where is your favorite place to dive”? Now I have an answer — the magnificent Maldives! FOR MORE INFORMATION: To book passage on the MY Manthiri contact Manthiri Liveaboard, North America Sales and Marketing Office 247 West Central Street, Natick MA 01760. Toll Free (844) – Maldive (625-3483) 508-651-0772 Fax 508-647-1588; manthirisales@massdiving.com ; www.massdiving.com/manthiri.htm. For more information on the MY Manthiri see www.manthiriliveaboard.com. -Getting to the Maldives: Flights are available from New York, Los Angeles or San Francisco on Singapore Airlines and/or Emirates Airline with convenient single connections and affordable pricing. -When to Go: Plankton season — June through November — offers outstanding and reliable Whale Shark and Manta Ray sightings. December through April transitions into 150-foot-plus underwater visibility with the likelihood of seeing large animals. -Daily temperatures range between 78 and 87 degrees Fahrenheit. During the year, slight variations in the temperature are caused by the monsoon. From November to April is mostly dry with little wind; the Southwest monsoon from May to October brings some rain and wind.